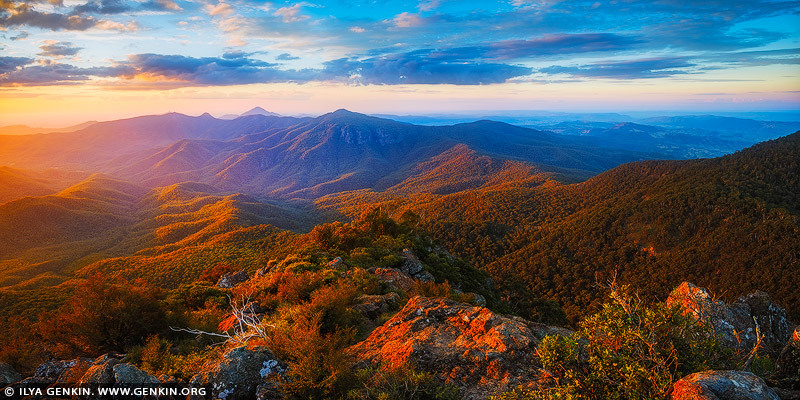 From the lookout on the 1512-metre summit of Mount Kaputar, 52km east of Narrabri, you will be treated to 360-degrees panoramic views encompassing a staggering 10 per cent of NSW, weather permitting. From the lookout, gaze north across Grattai Wilderness and Moree; look east and you'll see the impressive Liverpool Ranges and Boomi Creek; and westward there's Ningadhun and the seemingly endless plains. This image belongs to the travel and nature stock photo library. This stock photo of Mount Kaputar Summit is available for licensing for commercial and editorial uses including websites, blogs, books, magazines, brochures and advertising. Restrictions may apply for images which contain third party copyrighted material or sensitive subjects. Photos of artwork are for editorial use only. This image id AU-MOUNT-KAPUTAR-0001 of Mount Kaputar Summit, is copyrighted © by Ilya Genkin. This is not a public domain image.